I had banked some extra hours at work that I used on a relatively cool May day to explore some trails in Shenandoah National Park’s Central District, that criss-cross each other in the wilderness. 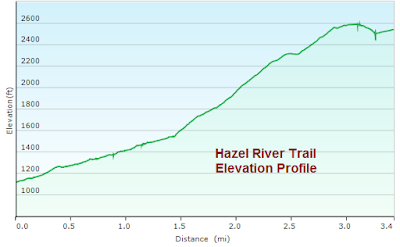 These trails are all in what is known as the Hazel Country, and I hiked several, including the Sams Ridge Trail, Hazel Mountain Trail, Pine Hill Gap Trail, Broad Hollow Trail, and the Hazel River Trail (hiked in that order). Smaller loops are easily accomplished out here. These trails are best accessed from parking outside the Park, coming in from Virginia Rt. 231, which is the spectacularly beautiful road connecting Madison to Sperryville, and is on Wandering Virginia's Top 10 favorite road segments in the Commonwealth. Also, it is among the most dangerous to drive, at least for me, as I spend too much time looking at the summit of Old Rag, and not enough time looking at the road in front of me. I've put off exploring these trails because I didn't know where to leave my car. Fortunately, I found instructions on Facebook, and I am giving them to you so you can arrive knowing where to park. Take Rt. 231 to Rt. 681, which is just north of where 231 crosses the Hazel River. Rt. 681 goes past some really nice houses and turns from pavement to gravel before you turn right onto Rt. 600, just after 681 crosses, again, the Hazel River. Follow 600 until just before a bridge, shown in the photo below. The bridge crosses, again, the Hazel River. Park at the wide spot on the right. There is room for only two or three cars here. View of the parking spot, which is the wide spot on the right. The bridge just ahead is your clue that you've found parking. Just before the bridge ahead on the left is the road to the trails. After walking down the road towards the Park, you will see concrete posts directing you to the trailhead for the Hazel River Trail. This is also the trailhead for the Sams Ridge Trail, even though these posts don't tell you that. 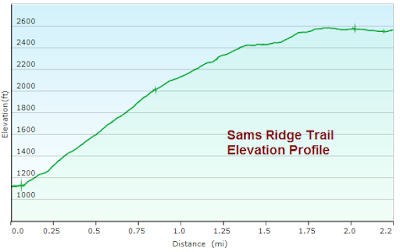 I followed the road past the trailhead, thinking Sams Ridge must start further up the road. I turned around when it looked like I was about to end up in somebody's front yard. 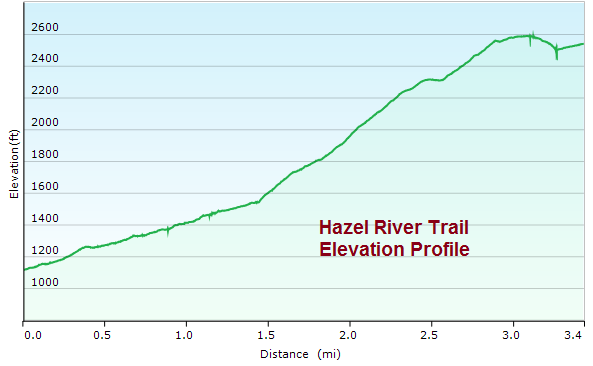 Sams Ridge Trail starts about 100 feet up the Hazel River Trail. Trail Map Link. This road takes the hiker to the Sams Ridge Trail and Hazel River Trail. Look at the tree on the left, and there is a small sign saying "hikers only." That is how you know you are going down the right road. It starts out by climbing on land outside the park, and does not enter the park for good until the 0.6 mile mark. And it climbs steeply. Or is it that I am out of shape? Not sure. 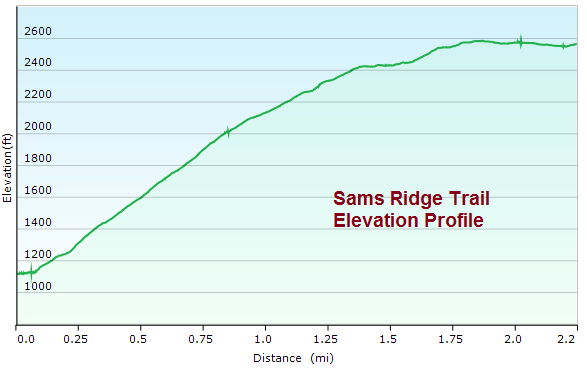 Then again, after reviewing the data, the Sams Ridge Trail climbs for over a mile at an average 19 percent grade. That is steeper than the run-of-the-mill SNP trail. But it brings you deep into Hazel Country very fast. "Hazel Country" is the term generally given to the area on the northeast portion of Shenandoah National Park's Central District, an area drained by the Hazel River. This area originally had homes and orchards, and most (if not all) of the trails in this area used to be roads accessing those properties. There are additional roads throughout this region that were not maintained. The current version of the Appalachian Trail Guide for Shenandoah National Park, 14th Edition, 2012, states that a spring near the end of the Sam's Ridge Trail is "to the right 200 feet down the abandoned Sams Run Trail." The 1973 Seventh Edition also highlights the "abandoned Sams Run Trail." So Sam's Run Trail has been abandoned for over 40 years, but is still referenced in the trail guide. (I would edit that out at this point!) 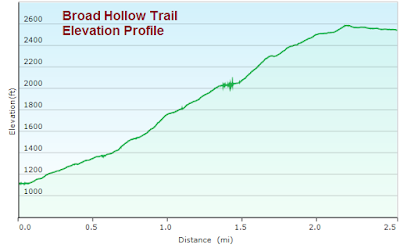 Sams Run Trail is so old that it isn't even found on current topo maps. Some photos of homesites along Sams Run can be found here: Link. I'll have to check it out sometime, but as Bill Fawcett - seer of all things off trail in Shenandoah - said about a month ago, "bushwhacking season is done" until the next frost. Now, this entire area that once contained homes is federally protected wilderness. It is amazing that wilderness exists in the eastern part of our country, and this wilderness can exist nearly right next to nice housing and small farms – virtually as soon as you cross the National Park boundary. Even more amazing is the fact that many of the areas we now call wilderness in Shenandoah were once villages and farms where people lived. Vistas were a rare occurrence on this hike. The Skyline Drive cuts near the top of the far mountain in this photo. At one point, coming back into the park on the Broad Hollow Trail after I looped out of its boundaries coming down the Pine Hill Gap Trail, I encountered a woman leading a small group of hikers. “Did you see the old house foundation about a quarter mile behind you? My guidebook tells me that there is one just ahead.” But going uphill I am less observant, and honestly, the forest is so thick here that I am not sure that I could see it anyway. I got talking with the group of hikers. They were very interested in what it is like to maintain a section of the A.T. after I told them that I did that, and I told them a story about Scoutmaster Me, the supposed “forest expert,” telling my scouts on a nearby hike about the Chestnut blight of 100 years ago and how it had such a huge effect on these mountain lands as all the chestnuts are long gone. After I was done with the hike, one of my assistant scoutmasters, a professional forester, privately corrected me. “They aren’t gone. They are still all around us but they can’t grow old enough to fruit because the blight persists to this day.” He then showed me chestnuts all around, including some that were showing the effects of the blight. And I did the same to this group – there was an immature chestnut, maybe 15 feet high and two inches thick, right next to where we were talking. But its trunk was already showing the effects of the blight. Chestnuts, and their long sawtoothed leaves, line the Pine Hill Gap Trail. How amazing is it that, nearly 100 years after the blight wiped out chestnuts across the east, changing mountain economies and perhaps paving the way for the federal government to purchase mountain lands for national forests, the chestnut still struggles to life from its old root stock? Shenandoah boasts the largest wilderness acreage of any unit in Virginia. Like the chestnut, the wilderness land is coming back – totally different than in the days before federal protection - taking back the cleared lands of previous generations. 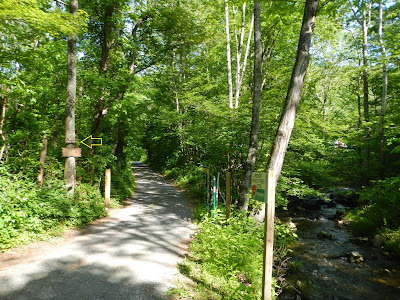 All four trails hiked start on Shenandoah National Park's eastern boundary at about the same elevation and climb to the same place - a flat area between Hazel Mountain and Catlett Mountain, inside the Park. Below are Elevation Profiles for each trail, showing distance and elevation as the trails climb. 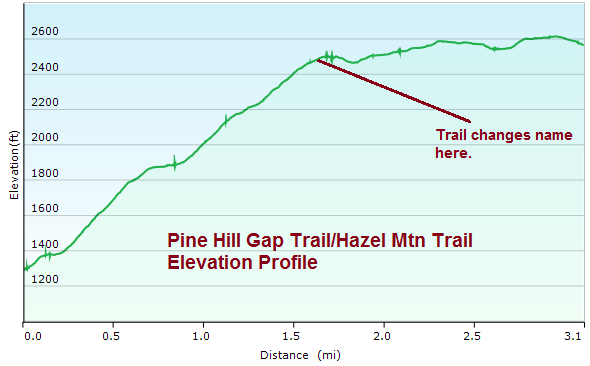 It is also possible to park at the bottom of the Pine Hill Gap Trail, as shown in the photo below. Hiker vehicles at the eastern end of the Pine Hill Gap Trail. 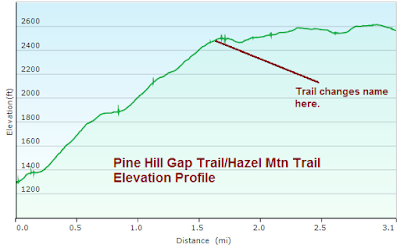 This permits a smaller loop hike involving the Pine Hill Gap Trail, Hazel Mountain Trail, and Broad Hollow Trail. You need to be careful on weekdays, though, not to park in or near the area marked for the school bus to turn around. As you can see from the photo, parking on the east side of the road near an old mobile home is your best bet. You get there by following the same route as the earlier parking directions (Rt 231 to Rt 681), but don't turn off on Rt. 600. Stay straight, and that should take you to this area. 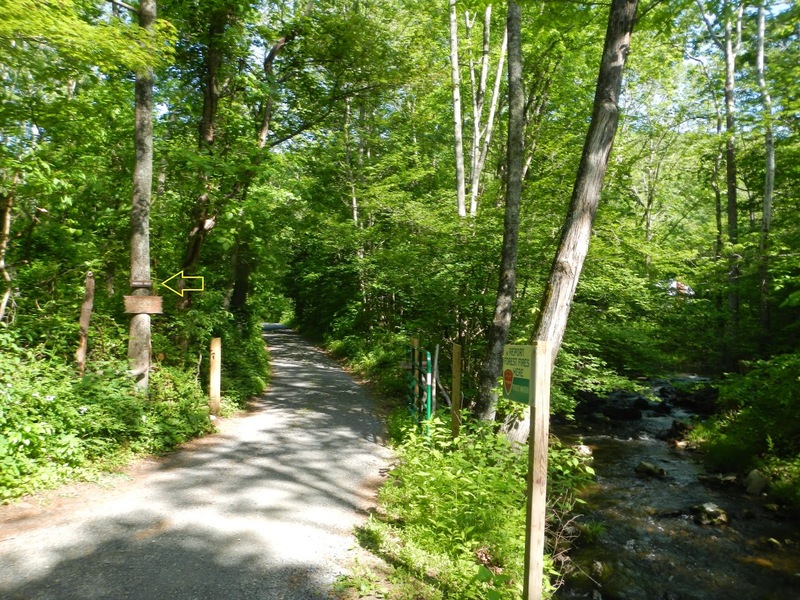 From the road, the trailhead for the Pine Hill Gap Trail is pretty easy to see - look for the concrete post on the old road to the right of the gate in the photo below. The trailhead for the Broad Hollow Trail is harder to pick out from the road. It is right next to a stream and next to a farm entrance. The photo below shows the trail and concrete post circled, as seen from the road. Not easy to see in the lush growth - so look for the tree marked "462 Weakley." For the day, 12.8 miles total hiked, including an estimated 9.9 miles hiked in wilderness based on wilderness boundaries found in Potomac Appalachian Trail Club Map 10 – the best map available anywhere covering this region. Catlett Mountain from a rocky overlook just off of the Hazel Mountain Trail. This overlook was near where the Hazel Mountain Trail became the Pine Hill Gap Trail. Informative commentary and pictures. Did Sam's Ridge to the marker for Broad Hollow trail. After the steep climb there is a relatively flat area where people had lived, farmed and hunted.